The cloudy background is perfect.Love the gems in her hair and cute buttons. Oh Scrappy ! This is sooooo sweet ! I love the background and the image is too cute ! Love your cloud background and the sentiment. Wonderful card. Super cute card and what a great sentiment. Thanks for joining our 'cuddly & cute' challenge at Totally Papercrafts, this week. this is a very nice card and a sweet image. Too cute. Love the sky and nice bright colors. 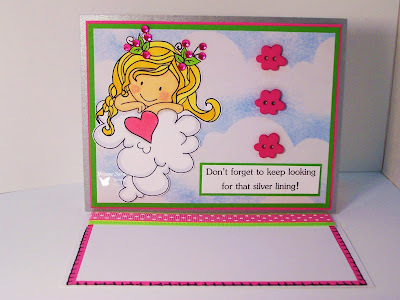 Scrappy - what a cute image and sweet easel card! Thanks for playing in our 'Flowers OR Flowers and Pearls' challenge! adorable stamp! love all the bright colors! thanks for sharing it with us at TPV! Very sweet card! Thanks so much for playing with us at TPV this week!! What a cute easel card! I love how you used our flower theme for this week’s challenge. Thanks for joining us this week at Pattie’s Creations Design Challenge. Sweet card Scrappy love the little girl. love this card scrappy! the colors are so fabulous! hugs! Love the sentiment on your card! Thank you for joining in at paper playtime! Very sweet. Love the bling and the background. Thank you for playing along with us @ Paper Playtime!